Target the Tour Training, a charter ride of EBTC, starting at Ardrossan Rec Centre on Sunday mornings, enables riders to prepare for the Tour de l’Alberta or other longer ride (or just get into good cycling fitness condition). It is a progressive ride that builds rider endurance. A focus of each ride will be safe cycling in a group. Bring your well-maintained road bike and cell phone for an enjoyable tour on good roads with some rolling hills in the beautiful County of Strathcona. Beginner to intermediate riders welcome! There will be sweep. Maps provided. Meet at SE corner of parking lot at Ardrossan Rec Centre 80- 1st Ave. Trip will start promptly at 11AM, 10AM and 9:30AM respectively. Please leave home early enough to arrive, get your bike ready and hear important information from your Trip Leader before group departs. 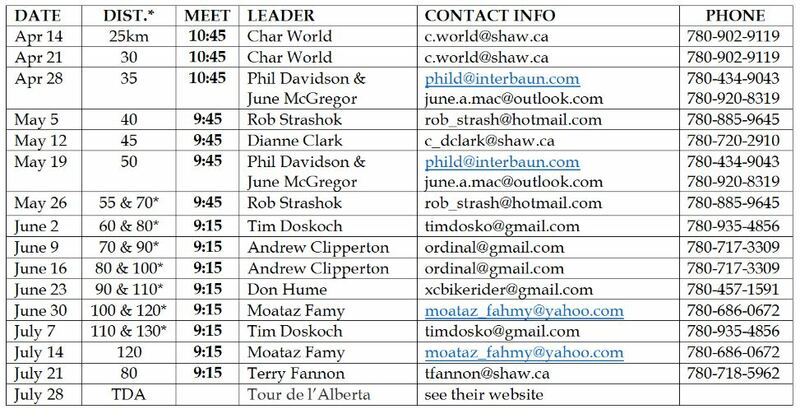 For general information about Target the Tour Sunday AM Training, contact Terry Fannon at tfannon@shaw.ca or 780-718-5962 (cell).